Blue Cross Blue Shield Overcharging Customers? Angry at How Much You Pay Blue Cross? 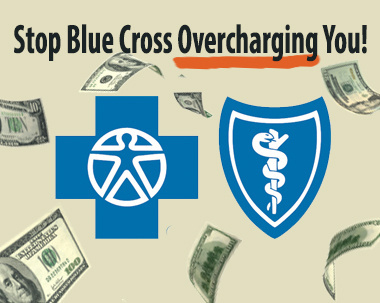 Join the fight against Blue Cross overcharging customers. Are you paying too much for your Blue Cross Blue Shield health insurance? Our firm is looking into Blue Cross Blue Shield’s business practices since they are suspected of overcharging their customers. Sign up now to help us fight Blue Cross Blue Shield to bring the costs of health insurance down. Our firm has been contacted by a lot of Blue Cross Blue Shield members who feel that they are just paying too much for their health insurance. After researching this issue, our firm found it odd that while many Blue Cross Blue Shield branches hold themselves out as “non-profits” they are actually in the business to make huge profits at the customer’s expense. Blue Cross Blue Shield is afforded many leniences due to their branches’ non-profit status and yet they seem to be exploiting this status to continually post greater and greater profits at the customer’s expense. Many of the people who contacted us are just plain mad! If you would like something to be done to curb the ever-increasing costs of Blue Cross Blue Shield health insurance then please fill out the contact form here now. If you’d like your voice to be heard, then fill out the form above. The more people that contact us with their experiences the more data we will have against Blue Cross Blue Shield in our claim for their overcharging customers. Any other comments about the Blue Cross health plans are also encouraged in our form above. Thank you.